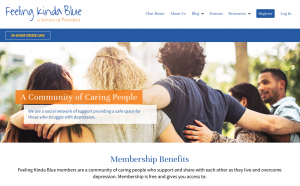 Be sure to check out the newly-redesigned Feeling Kinda Blue website (feelingkidablue.org), which provides a safe space for people who struggle with depression, anxiety, grief, emotional pain, and other mental illnesses to connect with others. The site has approximately 7,000 members nation-wide and is monitored by Provident’s team of professionals 24/7. Thank you to founder and funder of the site Sally Barker for her support and staff member Dayton Nelson for helping with the redesign process.